Bring the sugar and water to a simmer in a small saucepot. Stir so that sugar melts completely then remove from the heat and let cool to room temperature. Place the strawberries in a blender and process until smooth. Pour pureed strawberries in the sugar water and stir well. Add the lemon juice. 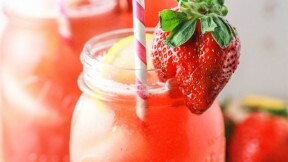 Combine the strawberry lemon syrup and the cold water in a large pitcher. Stir well and add lots of ice. Serve lemonade with thin slices of lemons and strawberries.